The Prospero’s Daughter Series draws from many older sources. This page contains some information about these sources. The Prospero’s Daughter Series is loosely based on Shakespeare’s last play, The Tempest. It is not necessary to be familiar with the play in order to enjoy the books. A brief recap of pertinent events is given in Chapter One of Prospero Lost. Indeed, the first part of the series has very little to do with Shakespeare’s play. In later volumes, however, the characters and events of The Tempest have more bearing upon the story. The Tempest is available to read online. It can also be found in movie form. A well-known version, PROSPERO’S BOOKS, stars the wonderful Sir John Gielgud, but it also includes a large number of not particularly attractive naked people. A new version is due out December of 2010, with the excellent British actress Helen Mirren playing Prospera, a female version of the famous sorcerer. So, what is The Tempest about? It is set on a remote island, where Prospero, the rightful Duke of Milan, plots to restore his daughter Miranda to her rightful place using illusion and skillful manipulation. He conjures up a storm, the eponymous tempest, to lure his usurping brother Antonio and the complicit King Alonso of Naples to the island. There, his machinations bring about the revelation of Antonio’s low nature, the redemption of the King, and the marriage of Miranda to Alonso’s son, Ferdinand. Shakespeare wrote a well-known account of my youth. His version tells how my father, Prospero, the Duke of Milan, was betrayed by his brother Antonio and sent into exile with only his books and my infant self for company. Stranded on an island, Father freed Ariel from the cloven pine in which the witch Sycorax had imprisoned him and received in return, a promise of servitude from Ariel and his kind. With the help of Ariel, Father called up a tremendous tempest. The storm blew to our island a ship carrying, among others, my wicked uncle Antonio, the King of Naples, and the king’s handsome son, Prince Ferdinand. I was, by this time, a young maid of fifteen – innocent and dewy-eyed – who had grown up with only Father and Caliban, the vile and misshapen son of the witch Sycorax, as company. Through the machinations of Father and Ariel, as Shakespeare tells it, I fell instantly in love with the handsome prince, the true perfidiousness of my wicked Uncle Antonio was brought to light, and Father was reconciled with the king. As we prepared for our triumphant return to Milan, where we were to celebrate the marriage of myself and Prince Ferdinand, Father drowned his magical tomes and freed his spirit servants. 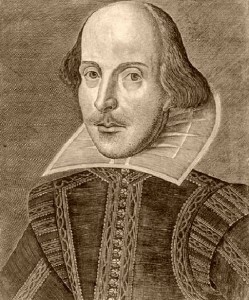 Only Shakespeare did not get our story quite right. Father never drowned his books nor freed his airy servants. Nor did I marry Ferdinand, who was but a tool of Father’s stratagem to reclaim Milan. At the age of five, Father consecrated me to Eurynome, the Lady of Spiral Wisdom and the Bearer of the Lightning Bolt. Handmaidens of Eurynome receive many privileges – among them immortality. Yet, every blessing has its price. Eurynome’s other name is Monocerus, Greek for “one horn,” and, unicorns only come to virgins. I was not about to trade immortality for the likes of Ferdinand, Prince of Naples! Each author who sets out to tackle writing about Hell has to decide how to portray it. In earlier versions of the story, Hell was not a place of any particular character. In some early versions, it was not hellish at all. As I continued writing, however, I felt that if I had introduced the concept of Hell, it had to be hellish. With that in mind, I reexamined Dante’s Inferno. While I wanted to use some of his ideas—to honor him, if nothing else—but somehow, the story felt static. It did not seem to be coming alive. I also felt that much of his work had shown up in previous fantasy and sf books and might be overly familiar to some readers. I also wanted a Hell that had a sense of poetic justice to it, where the locations seemed to reflect, at least in part, the nature of the crime being punished. By chance, I came upon a old book called A Wanderer In The Spirit Lands. 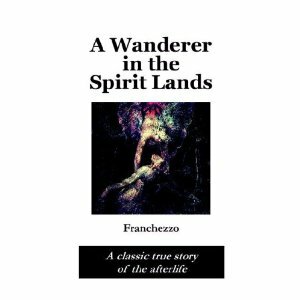 Written in 1896, it claims to be a channeled story told to the author by a young man named Franchezzo, who has died. Franchezzo led a bad life and would be in a worse place now, were it not for the prayers of a virtuous young woman who loves him. Thanks to her support, instead of falling into perdition, Franchezzo is able to join an organization called the Brotherhood of Hope, designed for wayward souls who wish to improve and leave their folly behind. The key to their salvation is to help others. Later in the book, Franchezzo and his fellow Brotherhood members descend into Hell on a harrowing mission, looking for souls who have learned the error of their ways who are ready for Purgatory. The intriguing and poetic portrayal of what Hell is like was exactly what I needed to make the Prospero story come alive. Delighted, I used the book as if it were a non-fiction reference work, borrowing ideas, locations, and even a few incidents and altering them to fit the Prospero saga. In gratitude, I dedicated the third volume, Prospero Regained, to the authors of A Wanderer In The Spirit Lands. A Wanderer In the Spirit Lands is in its entirety available online. Readers have asked me about the alternate version of the story of the Garden of Eden that Father Christmas tells Miranda, Mephisto, and Mab while they are waiting for the barghests to lose their scent at Landover Mall. This story as it appears is a mildly altered version of the story as told by the early Christian Gnostics. The version I first heard came from The Gnostic Gospel by Elaine Pagels, a book about the contents of the documents discovered at Nag Hammadi in 1945. I was in college at the time, and I was utterly charmed by the idea of a creation myth where the woman was not at fault. 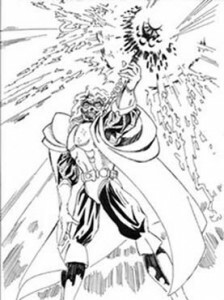 When I got to work on Prospero Lost, the notion of evil lesser gods and a benevolent greater god mapped easily onto the idea of a world created by demons but truly under the dominion by the Lord of High Heaven. Is the version told by Father Christmas the “real” creation story in the world of Prospero’s Daughter? Not necessarily. There seems to be evidence for both this version and the more traditional one. When Miranda asks Cain which version is true, near the end of Prospero Regained, he claims his mother and father told different stories about what happen. 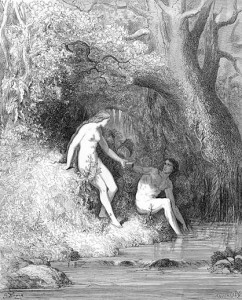 Since Prospero’s Daughter takes place in a multiverse, where there are many different worlds—though only the slightest glimpses of other worlds appear in the books—it is possible that both versions took place at different times in different places—both the version where Adam disobeyed God and the version where Eurynome saves fledgling mankind from the demons. The original On the Origins of the World from the Nag Hamma scrolls is available online. I fear it it is not as cogent as the Elaine Pagel version I heard in college. 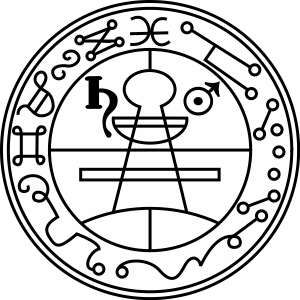 The names of the Three Shadowed Ones and many of the other demons who appear in Prospero’s Daughter are taken from The Goetia, based upon the17th century grimoire called The Lesser Key of Solomon. Baelor of the Evil Eye is not from the Goetia, he is from Irish myth. Seir and Osae are, as are many of the other demons who make appearances in Book Three. For more complete information about the Goetia demons who appear in the Prospero’s Daughter Series, see our page on The Staffs. Warning: Spoilers! The most popular version of the Goetia was compiled by Aleister Crowley. According to mundane history, Crowley was a student of the occult who garnered followers for his Hermetic Order of the Golden Dawn and wrote a number of works on Enochian magic. In the 1930s, he lived by Loch Ness. In Prospero Lost, Theo tells Miranda that the magician Crowley gave him a great deal of trouble and that he is leaving the monster Crowley released into the loch for Mephisto to clean up—but apparently their struggle was removed from the history books by the Orbis Suleimani. Mephisto apparently followed up on this, because Nessie is one of the creatures on the lower portion of the Staff of Summoning. The Goetia is also available online in a number of places. The Prospero Brothers and their sister Logistilla, along with the magic system that lies behind the staffs, spells, and magical creatures that appear in Prospero’s Daughter, have all been faithfully reproduced from The Corruption Campaign roleplaying game, designed by science fiction and fantasy author, John C. Wright, Esq. The Corruption Campaign is not recorded anywhere, so I cannot post a link. For more information about source material for the Prospero’s Daughter series, see the page on Poetry.